Two girl crushes in one week! Last Monday I was able to see Gwen Stefani at the No Doubt show. 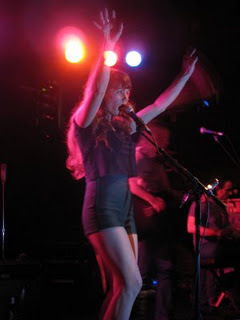 And on Friday I got to marvel at Jenny Lewis up close and personal. 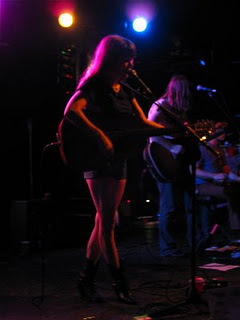 I wrote a blog post once about my love for Jenny Lewis. She's fabulous and talented and beautiful...and yes, probably my number one girl crush. I could hardly contain my excitement as we made our way to Cat's Cradle for the show. Jenny Lewis definitely did not disappoint. The show was out of this world. I was happy that she not only played tunes from Acid Tongue but from her other projects as well. I was really impressed with the caliber of musicians she has traveling with her. They're just all so talented, playing various instruments and harmonizing perfectly. The performances were energetic when they needed to be and slowed down when the time was right.